I was wrong about summer coming early. The sizzling hot temps lasted about two days. It did fry our early red tulips in the birdbath garden but our mid-season white tulips emerged and were greeted by seasonal New England temperatures…. warm days and cool nights. After a day of glorious rain yesterday, we woke today to our customary cool spring today. White tulips against a groundcover of “Tide Hill” box brightens up this border before any sunlight appears over the woodland surrounding us. “Tide Hill” is a wonderfully compact littleleaf boxwood that is tolerant of our icy, cold winters and does fine during hot, humid spells during the summers. It only grows about a foot in height but will spread about 4 feet in diameter. It’s a perfect groundcover for our garden entry highlighted by a few florals…. and eventually “Karley Rose” fountain grass in a container. Both the box and fountain grass were purchased at Rolling Green Nursery in New Hampshire. New to the border this spring is “Starlight Sensation,” a new hybrid daffodil (below) from Brent and Becky’s Bulbs in Gloucester VA. It won the “Best Daffodil” at the 2017 Philadelphia Flower Show so I was on the phone to order that day. This is its first season but eventually we should have multiple nodding blooms per stems. The buds are a shade of yellow and open to a creamy white. Three shades of muscari will eventually spread and fill certain borders… this one with a backdrop of “Becky” daisies. I worried because the muscari green leaves were perfect fodder for our bunny. They were eaten to the ground several times but we have regrowth and blooms. Bunny has moved on to clover. That’s it for the bulbs but herbs are looking good, serviceberry trees are glorious and crabapple tree is ready to burst on the scene with pink blossoms. More to come….. I find myself a little bit out of control in this department. Downsizing from 12-acres to 12-feet causes problems with my compulsion to add to our garden. It’s not really 12-feet but sometimes it feels like it when I come across something I really desire for the garden. This time it was bulbs I lusted after. I ordered narcissus bulbs “Starlight Sensation,” for the following reasons: It’s a creamy white flower that I prefer, it has 3-5 flowers per stem with 3-5 bloomstalks per bulb. That’s a lot of flowers, folks! And the good news is that it won the Best Daffodil award at the Philadelphia Flower Show this year… and the best news of all is that it’s the very own seedling of friends Brent and Becky Heath in Gloucester VA. I will forgive myself for this purchase! But maybe not forgive myself for the purchase of two different shades of allium bulbs, red tulips, white tulips, snowdrops, and two more shades of muscari to add to my deep blue muscari that edges the boxwood garden. Oh well… everything is in the ground and I look forward to seeing what the spring brings. I was quite happy to see the announcement on Instagram and Facebook that the Philadelphia Flower Show named a hybrid daffodil created by Brent and Becky’s Bulbs as the “Best Hybrid” in the show. And there was a lovely photo of the winning blooms “Starlight Sensation” next to the ribbons. I was thrilled to see this but not surprised. Brent and Becky’s Bulbs is top notch. The company wrote that it takes 5-7 years form pollination to 1st bloom and another 5 – 7 years until the bulb hit the market. When they added that this hybrid is ‘one of, if not THE best hybrid we’ve created to date,’ I was interested. I have tulips but have not really added daffodils to the garden and these would be perfect for my white garden, especially since the blooms are as tall or taller than the leaves. I knew these bulbs would soon be in short supply so I ordered right away. And, no, they said, I wasn’t the first to call. The bulbs will be shipped in September and I’ll see the blooms in the spring of 2018…. well worth waiting for, I think. 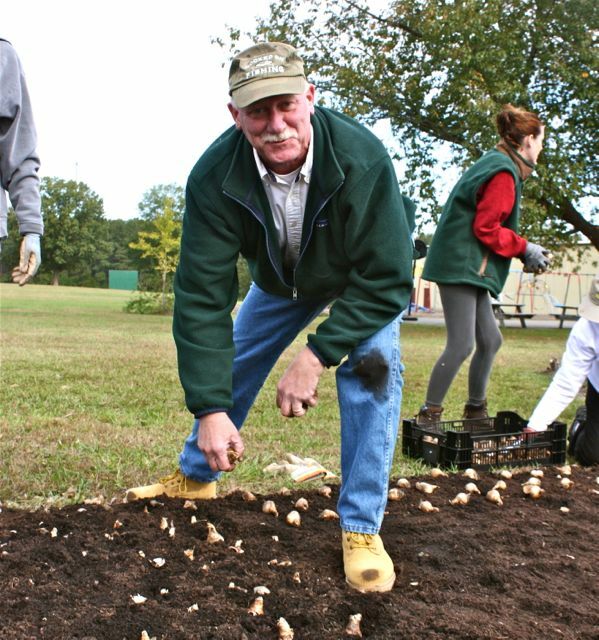 Yesterday, 32 members, family and friends of the Garden Club of Gloucester completed Stage II of a three year commitment to bring “A River of Blooms” to Ware Academy in Gloucester. Last year the club began the project by planting over two thousand bulbs and this year we added another two thousand bulbs from Brent and Becky’s Bulbs located just a stone’s throw from the school. 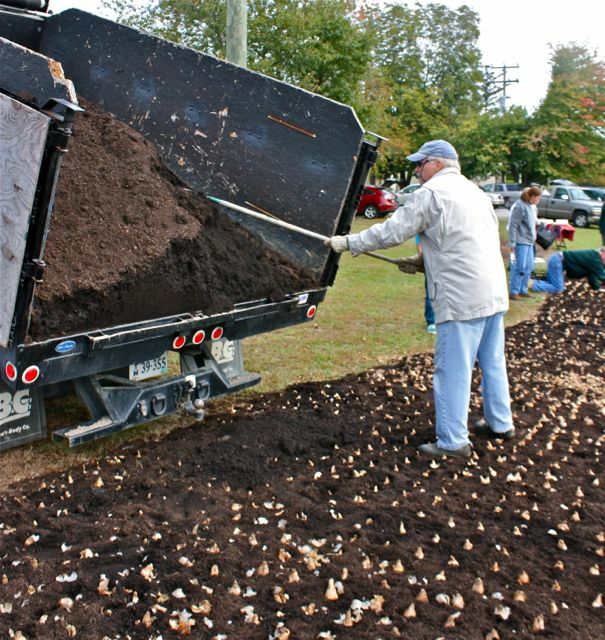 Temperatures were brisk when the first trucks arrived with compost that was spread 2″ thick over the designated area. 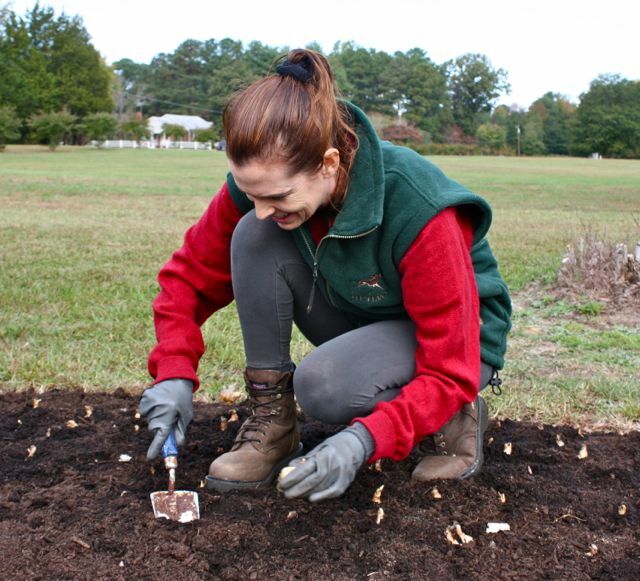 Borrowed from Brent and Becky was a metal grid that was pressed into the compost to show squares where single bulbs would be needed. 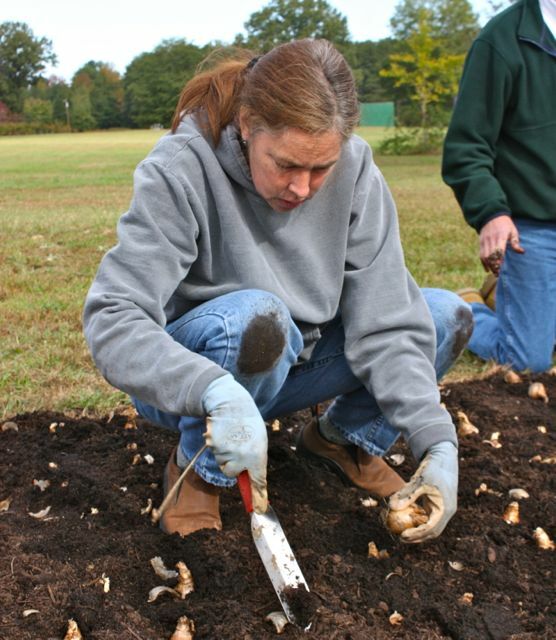 Members were assigned to an area and gently eased the bulbs into the compost. More compost, then a cover of shredded pine bark mulch spread across the top finished the job. Saint Keverne, Ice Follies, Primeur, Salome, Hillstar daffodils will continue the river of February Gold, Geranium, Pink Charm, Ice Follies, and Tripartite planted last year. We expect all to be in bloom when we invite the public to the Garden Club of Virginia’s 78th Annual Daffodil Show at Ware Academy in Gloucester on Thursday and Friday, March 29-30. We hope many will plan to stop by the show and be a witness to a room full of daffodils… all shapes, colors and sizes. Brent and Becky will also have a display of the best of the best daffodils from their gardens. Awe and amazement are guaranteed. Ware Academy is located on John Clayton Memorial Highway conveniently located between Gloucester Courthouse and Brent and Becky’s Bulbs.